Remembering Holly | Holly's Footprint..
Again it’s been a while since we updated the website to let you all know what has been happening with Holly’s Footprint so we’ll try and bring everything up to date today. First of all last week was the first anniversary of Holly leaving us all. It was a difficult day but we were overwhelmed by the number of friends and family who came along to Holly’s place to remember her with us. 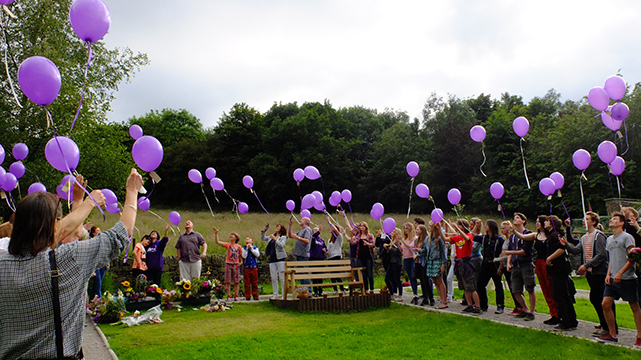 We decided to let off some purple balloons with little tags attached so people could write a message to Holly, before letting them go off into the sky (and surrounding trees). The balloons which did not make it very far were collected up and the messages tied to new balloons and sent on their way a couple of days later. We heard that one of these balloons had made it’s way over to Edale where it had attached itself to the gate of someone who knew Holly. Thanks to everyone who came that day or sent messages if they were not able to be there in person, and thank you to everyone who brought flowers, plants and other things for Holly.